How Do I Find My Glasses Size? If you currently own a pair of prescription glasses you will see 3 sets of numbers on in the side of your frames. The 3 sets represent the information below. Measure the lens horizontally (width) which is the most important measurement. Measures the shortest distance between the left and right lens. 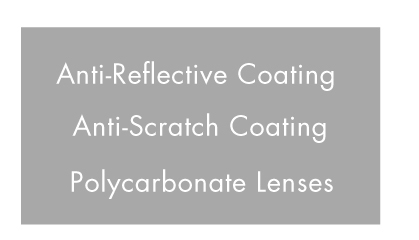 All our prescription lens are made from high quality polycarbonate material and have Anti-Reflective (AR) and Anti-Scratch coatings included with all orders.